“All I want for Christmas is a teddy bear,” the eight-year-old daughter of vicar of Christ Church in a small Welsh village requested. Nothing wrong with this request. In fact, very reasonable request, indeed. It was only the timing that made it wild: 7 p.m. on Christmas Eve. As the vicar recounts the story, he not only had the trouble of fulfilling his 8-year old’s wish to have a teddy bear like her brothers and younger sister, but also to taking Miss Peggy to midnight mass during that same time. Now, Miss Peggy, a large and eccentric woman, was also asleep in her chair when he arrived, and the Mass was uphill a significant mountain. Nonetheless, by the grace of God, the seemingly impossible was accomplished. The eccentric and elderly Miss Peggy made it to mass and back, in none worse for wear. As Peggy settled in for Christmas eve night, she asked the vicar if he knew of anyone who might want a teddy bear? She had one to give, but it wasn’t going to be given. The intended recipient hadn’t the space for so large a bear. With amazement, the vicar left and put the large bear in his small car. So, the next morning the teddy bear awaited the eight-year-old daughter as she tumbled down the stairs to see if Christmas had come again1. Incredible, the unexpected gift that accompanied the seemingly impossible task of Miss Peggy’s annual outing to midnight mass as the vicar was mildly following Jesus and wildly seeking to live God’s way. Unexpected gifts of their very nature cannot be traced or charted. They wiggle away from being tracked down or counted. A way of life that is less about Christmas as a cultural destination and more about Advent as a life prophecy where God’s ways break through where we least expect God to show up. Mary’s song is not at all the mild Christmas card version of a quiet child and a reflective mother. Mary’s song is about justice that extends beyond the season of Advent, and does not fit neatly into a Christmas card. If God is in the business of choosing the unlikely to God’s very self to the world, we ALL better watch out! God is using us! 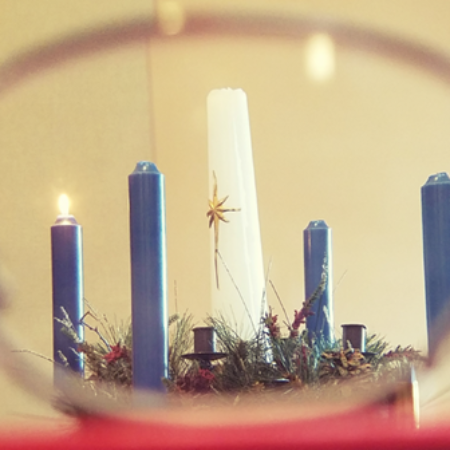 Our fresh Advent eyes remind us, we are in the Nativity as much as we are studying it. Mary is a prophet in the most biblical sense. Mary has agency and choice. In a season where we find ourselves talking increasingly about consent, it is good to notice, that even here, God asks Mary to carry the God’s very own self. She affirms. Here, I am, use me. She observes the life she is living. Biblical prophet less predicts with fanfare the future as if they were considering crystal balls. Prophets look back at what has been, look around to see where the world is at present, and look around to where to see where we are living in this moment. A prophet of God then speaks on behalf of God for where we should be living for God now, mildly following Jesus and wildly seeking to live God’s way. It was only fifty years after the birth of Jesus that Paul’s letter to the church at Thessalonica was mild and wild. It was filled with encouragement to the heavy hearted, as well as a radical reminder for ordinary rebels. Lived as though who could remember the life of Jesus in their rearview mirrors. Give thanks, even when you would rather spend time complaining. Rejoice, even when nothing feels worthy of joy. Paul, who spoke as a prophet, not because he was looking for everyone to smile on their Christmas card. Paul, who also learned to be content in all things, calls us to wildly praise God, even when the burdens are heavy, as Mary did. What can that look like? Mary today, might have proclaimed that the CHIP, the Children’s Health Insurance Program, will cover all children, even if tax cuts for the wealthiest 1 percent do not. Mary might have sung the praises of God who cares for the needs of each child who needs preventive care for immunizations, education for well visits, access to healthy foods like fruits and vegetables, more than convenience stores and additional state liquor stores to be zoned in municipalities. God lifts up the vulnerable children in need of health care and protective services. Mildly following Jesus and wildly seeking to live God’s way. Mary today, might have proclaimed accessibility for all medications for seniors regardless of incomes, but especially for those mature adults who incomes no longer cover their daily living expenses. Filling the hungry with good things and sending the rich away hungry. God cares for the needs of those most in need of God’s compassion and concern, engagement and care. God scatters the proud and haughty. You and I might also find ourselves looking square in the face of Mary. Not recognizing her without the blue veil draped kindly around her face, and wondering where Jesus is exactly. One of the things I love about Chapel time is that my preschool friends have no trouble picking up on what is most important. I need to share with you that we have seven classes in our preschool that range from 18 months to “just about ready to rule the world” at the age of 5. Since we finished talking about saying thank you (that was the messaging for the month of November), it was time to get ready for Christmas. When I asked them why we were getting ready for Christmas, a few told me that Santa was coming; a few told me that we had to get a Christmas tree. But many of my sweet friends told me that baby God was getting ready to be born- ed. Baby God is getting ready to get born – ed. That’s who Jesus is. They told me, he is baby God. Mary, shocked by the outrageous nature of God, had the good sense to follow along as God guided Mary. This is what Mary knew when the angel told her that she was going to carry a child, even when the gynecological piece didn’t work out clearly in her mind. Mary proclaimed the power, subversive and mild of Jesus the Christ to turn the world right side up as accepted the challenge and privilege to bear the child of God. Mildly following Jesus and wildly seeking to live God’s way. You and I might find ourselves as Mary today. As God whispers in our ears and points to where the world has been turned right side up. To places where the proud have been brought low and the lowly have been lifted up. May, we too live as those who are mildly following Jesus and wildly seeking to live God’s way. This is the Gospel of our Lord Jesus Christ, thanks be to God, Amen. 1“December 14” by Patrick Thomas from Prayer for the Day: 365 Inspiring Daily Reflections edited by BBC Radio, 2014., 374. Rejoice always, pray without ceasing, give thanks in all circumstances; for this is the will of God in Christ Jesus for you. Do not quench the Spirit. Do not despise the words of prophets, but test everything; hold fast to what is good; abstain from every form of evil. May the God of peace himself sanctify you entirely; and may your spirit and soul and body be kept sound and blameless at the coming of our Lord Jesus Christ. The one who calls you is faithful, and he will do this. for he has looked with favour on the lowliness of his servant. And Mary remained with her for about three months and then returned to her home. Sunday: “And Mary said, ‘My soul magnifies the Lord, and my spirit rejoices in God my Savior,” Luke 1:46-47. Mary’s response to the news of Jesus is joy. Where have you known joy ? Monday: “He has brought down the powerful from their thrones, and lifted up the lowly; he has filled the hungry with good things, and sent the rich away empty. “ Luke 1: 52-53. Mary’s song of praise comes with knowledge that God rights the wrongs of the world. Look for where God is bringing justice. Tuesday: “And Mary remained with her for about three months and then returned to her home.” Luke 1:56. Mary and Elizabeth together. Pray for those who lift you up and who you need to lift up as well. Wednesday: “Rejoice always.” 1 Thessalonians 5:16. Rejoice defined indicated to find joy again. We only need to find joy again when we lose joy. Joy is easy to lose. Life lived loses joy. In the hustle and bustle. In the fullness of life, joy falls out. Today, take moments to find joy again. Thursday: “Pray without ceasing.” 1 Thessalonians 5:17. Paul’s letter might seem more Lenten than Advent. However, as we prepare for the coming of the Christ child, we pray. We pray for our world and ourselves. We pray for our children (those we hold dear), and the children of the world. Praying without ceasing is an invitation to let every thought be a prayer. Friday: “Give thanks in all circumstances; for this is the will of God in Christ Jesus for you.” 1 Thessalonians 5: 18. During a holiday season, sometimes challenges feel heavier. Giving thanks can be more strenuous. Look for true blessings in challenges. Saturday: “May the God of peace himself sanctify you entirely; and may your spirit and soul and body be kept sound and blameless at the coming of our Lord Jesus Christ. The one who calls you is faithful, and he will do this.” 1 Thessalonians 5: 23-24. This benediction is a prayer. Put this prayer on your bathroom mirror to pray each time you brush your teeth.